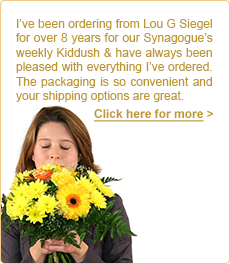 Lou G Siegel offers a wide range of baked goods that are all made on premise in our bakery. World famous Rugelach, Babkles and Linzer tarts are amongst our succulent variety to tempt you. So good luck trying to diet on these delicious treats! Beautifully hand packed for overnight shipping anywhere in the USA our crafted decorated cakes, cream puffs and cannoli will bring joy and good memories into your home. You'll then sense the aroma of our fresh baked pies, breads, brownies, crumb cakes, cupcakes, and cookies. All our baked goods are made daily and do not contain any preservatives. Lou G Siegel bakes the same way using many of the same recipes as when we started over 50 years ago! 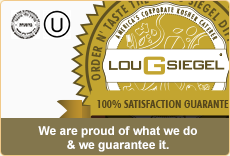 Order the best and taste the difference of the Lou G Siegel Bakery.